The Chart below shows the Gold Bugs Index of mining stocks that is a representative index for most of the good Gold Mining funds such as Tocqueville Gold which I own and which was discussed in an earlier update. 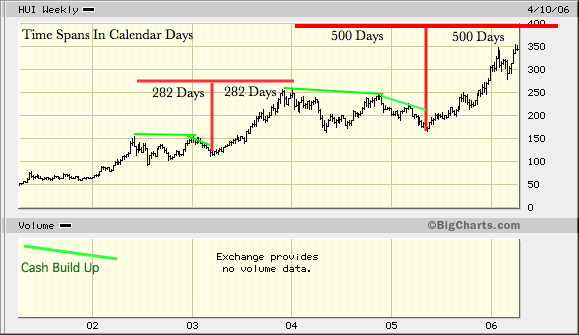 At that time I made a rough sketch of the intermediate T interpretation of the bullish trend coming out of the May 05 low and concluded that the Gold Funds, stocks and metal plus probably and natural resource oriented investment would climb fairly steadily into mid year 06. With the new chart of the HUI I want to spend some time refining the construction of these two historic Ts for the key Gold Mining Index and establish some specific dates for the T Theory time projection. The early T coming out of a Feb 2003 low is completed so we can establish one completed projection. The second T is sustaining itself well but we need to make a more precise calculation of its projected peak date. Most Ts show actually tops as double tops and are likely to top a bit early so the usual objective is to sell what you want before the computed date arrives. 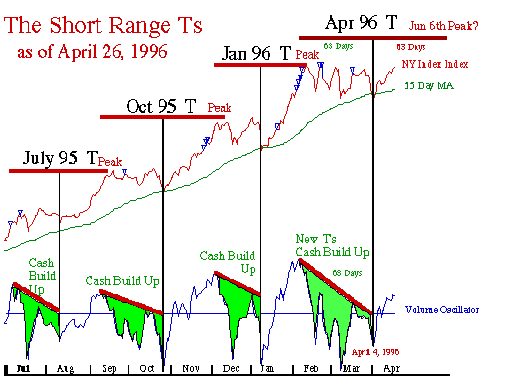 In this update of the Short Range T picture we see potentially the right conditions for the formation of a T as per my chart below. If the trend is a continuing bullish one then the history in the second chart shows the center-post low of a new Short range T is possible from any low sitting on the 55 Day Moving Average of the S&P. We are at that juncture now. Any real strength near term could therefore start a new T as long as the 55 Day MA is not breached downward to any great extent near term and the Oscillator eventually breaks above the green Cash Build Up line sketched in my current chart. Terry, I really have learned and profited from your work. As I understand one of the challenges is determining the breakout of the declining tops, I have possibly come up with a way to better help judge if the new T is beginning. In the attached excel file you will note in the tab marked current chart, I have put a 10 period sma on the T chart. I only have data back to 2002 but the vast majority of valid lows that start a new T come from a level that allows the SMA to get at a minimum below the -50 level. Additionally, as the new T begins to lift the market, each subsequent pullback to the 89 EMA in the index typically will correspond with a turn back up in the 10 period SMA. I would like to test this over a longer period of time to check the validity, but over the last few years it has made me a tremendous amount of money. I thought his concept was original and worthwhile, so I am moving to expand on it as the two of us research it back well before 2002. He has my data and will report later. In the meantime, I can get started on a few points needed to introduce the philosophy. His starting point was the book Pit Bull in which Marty Schwartz described his success in using the Volume Oscillator to trade S&P futures. He down loaded the McClellan Oscillator Data, using the link at the left, and developed his own Excel spreadsheet to research his own ideas. The Kemp PDF file of his volume oscillator with a slow moving average of the Volume Oscillator is provided below. One complicating factor is that the McClellan data has its volume calculations scaled to one tenth of mine. So his criteria of first seeing an oversold condition in which a ten day moving average of his Volume Oscillator is down to a minimum of -50 corresponds to a 10 Day MA minimum of -500 in my chart. As the McClellan data is likely to be used by readers and its 4 year record is updated daily, I will make it easy for everyone by dividing my volume data by 10 so the plotted values would match anyone’s calculations derived from the link. I regard this requirement of a minimum oversold condition as an important first requirement for aggressive traders who are speculating, particularly if they are leveraged. I believe his success results in part by not fooling around with marginal situations. We are both considering a study of the much longer history going back some decades to see what the trade off is for an aggressive trader with regards to a minimum oversold condition. I will address this aspect in a few weeks with a historical study to be posted at the T Theory Foundation site. The second aspect of the Kemp criteria is to use a separate moving average of the volume oscillator to track its recovery from a suitable deep oversold condition. The Kemp PDF file shows the addition to his volume oscillator plot. There are no date labels on the horizontal axis but the chart shows the rise out of the October low and you can easily compare it to my first chart. Confirmation of a turn is given by the slower moving average when it changes from a decline to an upward slope. Pullbacks, to or slightly below this moving average, if it is headed up, are now interpreted as reasonable buying opportunities. Only when all these criteria are met, is is very likely a powerful new T is underway with good upside price potential. Much historical work needs to be made and presented before any definite conclusions will be reached. But it seems clear that the opportunities available by the natural succession of Short Range Ts, will have to be divided into categories. The better risk reward ratio for establishing new positions will require a new T in a suitable deep oversold condition. 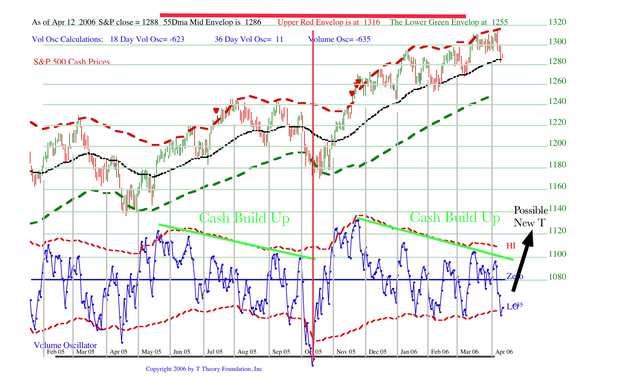 If the current situation does not see a break down below the 55 Day MA then no real oversold condition can be present. Only if the Volume Oscillator is very deeply oversold will it provide early indications of a turn, so this is an important pre-condition. However as I have mentioned, if you translate the equations from days to hours or minutes then you could then find a comparable concept that would be useful for much shorter trends. Finally I should mention that this criteria doesn’t really apply to investors who take the longer view. In T Theory, the Advance-Decline Ts provide the better long term outlook. The Advance-Decline line continues to maintain its up-trend so there is no reason to become bearish at this point, as a new T could produce additional gains ahead. However one may not want to add new positions until a solid buying opportunity presents itself in a more oversold condition. Anyway, that is the way I see the concept developing. We are working on this interpretation and expect to post more research later this month. This entry was posted on April 10, 2013 at 5:57 PM and is filed under . . . T Theory®. You can subscribe via RSS 2.0 feed to this post's comments. You can comment below, or link to this permanent URL from your own site.